If you missed it, Disney just re-released Cinderella on Blu-ray DVD. This quintessential fairy tale originally brought to life by Walt Disney in 1950 is more popular than ever… not so much because women are looking for the perfect man to rescue them from their humdrum lives but, because the modern Cinderella continues the quest for the perfect shoe!!! Even better, Disney partnered with shoe design guru, Christian Louboutin to bring the famed glass slipper to life. The Louboutin version is made of netting instead of glass for obvious reasons but the sparkling Swarovski crystals remind you of the delicate and reflective nature of glass. You will have a hard time finding them since there are only 20 pair of these remarkable shoes being made and are being ‘given away’ in various Disney promotions around the globe. Congratulations Mr. Louboutin for a job well done, Walt Disney himself would be proud! Feeling like Cinderella and can’t find the right sparkly shoe to fit your budget or your sole? Princess Bridal Shoes can turn just about any ordinary shoe into a show stopper! In difficult economic times most people look to save a few dollars on the pricier items they need for their wedding. 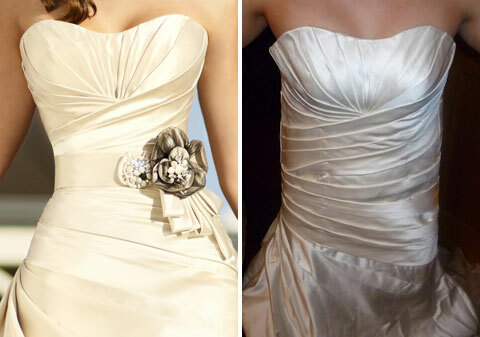 Since the average wedding gown costs about $1500, I would estimate that the average designer gown is about $3000. Although this seems like a great place to shave off a few dollars, it is also the place where you are most likely to be scammed when you don’t know what you are looking for. Designer merchandise is more expensive for several reasons; a lot of time has been put into fit, fabrics and materials are higher quality and the construction is considerably better. Considering that almost all ‘replica’ merchandise is made in China, that should tell you something. Christian Louboutin shoes are extremely popular right now and are about the easiest fakes to recognize. For a while, the flagship store sold the designer shoes with a baby blue sole to represnt the ‘something blue’ for brides. If you are thinking of purchasing a pair of those rare limited edition blue soled shoes, I can offer no help as I have not seen the real or fake in person. However, the red soled Louboutins have a shiny red, flexible sole with no other color present. Fakes almost always have a thin black band at the shoe part of the sole, have a matte finish and are more stiff than the real ones. Another hint is that the back of an aunthentic Louboutin will have a smooth, straight seam with no tab or overlap. I just finished reading a shopping alert telling the story of unscrupulous shoppers who buy, wear and return merchandise all the time. Here’s how it works: they buy the real shoes and return the fakes. Many times the unsuspecting store employees don’t even know the difference until it is too late. Can you imagine buying a $700 pair of shoes and getting dime-store knock-offs? The word furious comes to mind, along with a few others. Designer Bridal Gowns –Tags means nothing. A long, long time ago I used to work in a salon where we removed every tag from every sample gown the minute they arrived… I still don’t know why. The point is that we had (on hand) large containers jam-packed with authentic designer labels. If someone were not honest, they cold pass off a replica as authentic simply by sewing this into the gown of an uneducated consumer. I do not know of any reputable salon that engages in this practice but, if someone were so inclined- it is very easy to accomplish. The best way to spot a fake is to see it in person, ask to see the sample and compare as many of the details as you can. The best way to avoid this in the first place is to shop only with authorized retailers of the gowns you select. Contact the designer or look on their website for recommended retailers in your area. An even better way to avoid this is to purchase your gown at a trunk show where the designer or a representative is present. Accessories –Headpieces and jewelry are harder to spot since they are not as often copied. Shop on the internet if you will, but purchase in person. When you come across a high end headpiece or jewelry designer like Maria Elena or Cheryl King you will want to make sure you are getting what you pay for. Again, ask for an authorized dealer in your area and avoid the internet. Purses –Glad you asked. Purses are the most often copied merchandise and the hardest to spot. It is all in the details. Sloppy stitches, buckled material, crooked stones are all signs of a fake. If you are buying a Judith Leiber bag, remember they DO NOT have serial numbers embossed like other designer bags. They are lined with leather, usually silver or gold metallic and the stones are sizes 7-12. WORST OFFENDERS: The internet is a hotbed of fraud. Anything that seems too good to be true, probably is. If you care about the label, about the construction, fit and fabric, purchase only from a reputable retailer. This is true for any of your wedding merchandise. Ebay has cracked down on counterfeit merchandise, at one time hosting hundreds of counterfeit items claiming to be real. Now the counterfeit items have to be sold as such. There are some legitimate, authentic designer items for sale on the internet but these items are usually samples or have been previously worn or used. Know what condition the item is in before you buy. Remember- You get what you pay for. Never buy an item missing tags or labels. Always purchase from a reputable, authorized dealer. If you think you have been sold counterfeit designer merchandise, contact your state’s attorney general and file a report. Make sure you have all pertinent information including date and point of purchase, name of seller and the form of payment used. You may also have recourse through the credit card company if you purchased using a credit card.